I like it when grounded reality meets up with virtual reality. A reference to a “viral” Stanley Kubrick homage video came across my Facebook stream today. It is very appropriate considering the topic from today’s Interactive Storytelling lecture was Giotto, Cimabue and perspective in storytelling. The video highlights the consistency of one-point perspectives within the frame of Kubrick movies. 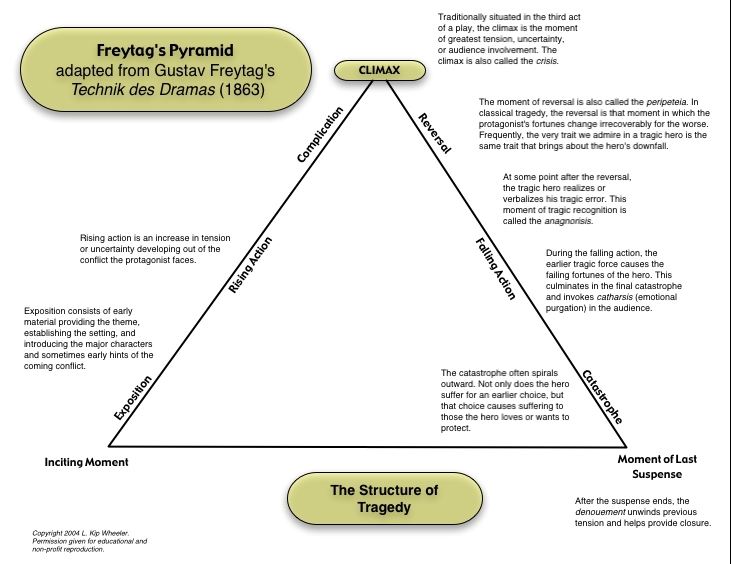 Much like Campbell’s hero’s journey, Freytag’s pyramid and Aristotle’s dramatic arc, these are quintessential elements of storytelling. The ludology vs. narratology debate is white hot. Hot with anger and attitude. Hot with pretentious academics (present company excluded of course) wrestling over the validity and value of their established or burgeoning field’s right to study games. Both sides make sense in the context of their field and knowledge. Both sides have strong reasons why theirs is the better way to examine games and, yet, neither side appears ready to believe that they could be equally important. Ludology – The focus of game studies should be the rules. Games are to be understood on their own terms. Aarseth (2004) argues that games have three aspects: “rules, a material/semiotic system (gameworld) and gameplay.” A narrative is just an (unnecessary) overlay for these three aspects. In Aarseth’s view, games should be studied on their own terms and in their own rule set despite any narratives. Aarseth believes that the “value system of a game is strictly internal, determined unambivalently by the rules.” That is the ethics of a game are based on the code from which it was created and should only be studied for their manifest expressions. To Aarseth a game like Doom has no need for a latent moral dilemma via narrative because “in doom, there is no moral dilemma resulting from the killing of probably innocent monsters.” In this way the killing of monsters is an understood aspect of gameplay. This rule is coded into the game, if not required for gameplay. However one could argue that there may be moral obscurity within some gameworlds which may or may not be accounted for in the rules. The first example that comes to mind is the player’s possible moral dilemma of “harvesting” little girls in BioShock. The game presents the player with the option of “harvesting” the “little sister”, a morally bad decision, and gaining an immediate reward vs. “rescuing” the “little sister”, a morally good decision, and reaping the benefits of a reward in the long run. The possibility of being neutral is only available if one harvests and rescues little sister non-player characters in equal amounts. Thus the player has only three choices. The rules within the gameplay do not allow for shades of grey and perhaps that is part of the reason why ludologists dislike the idea of narrative leading the way. At their core, games are their rules. Specifically video games are 1s and 0s, yes and no, black and white codes– but that may not always be the case going forward. Given the speed of technology in the past 20 years, one has to begin to wonder what happens when there is an infinite decision system for morality built into games. Although current triple A games can be morally dichotomous (i.e. you can be good or you can be evil) a future where game development budgets are expanded to allow for a larger decision pool may not be that far away. We’ll talk a little more about the financial robustness of the game industry in a moment but first let’s take a look at another game example where the morality and rules are not explicitly programmed? Each game in the Grand Theft Auto series is a set of rules which the developer created to structure the gameworld and gameplay. Although these rules establish the value system of the game, a user can still implement their own rules into the gameworld thus causing ambivalence to the developer’s rules (or lack of). For example, I am notorious for stopping at red lights in GTA. This is a self-imposed rule. A rule that is at odds with the base-level presumption of the game – kill, damage things and ignore the civility. It a rule part and parcel to the moral dilemma I face when interacting with the GTA gameworld. The rules of the game allow a player to stop at red lights so it is well within the game’s programmed rules but is not an explicit (read: coded) part of those rules. It is also understood that the characters are not sentient but it should not be taken for granted that we do not have the capacity to feel for them. In a 2009 study, Mast assessed children’s experiences with artificial companions and found that “children saw Furby more as a real animal than a plush animal.” If our capacity for empathy toward pseduo-sentient non-human furry toys is possible then why not the soon-to-be photo realistic video game characters as well? © 2010 Hudson Square Research, Inc.
All of the authors are guilty of making assumptions which appear to have no scientific evidence for support. Although I am willing to assume that the information is correct, it is difficult to determine what is conjecture and what is hard science. For example, Aarseth claims that “Culturally, especially in ‘high culture,’ stories dominate still, but are currently losing ground to the new simulation-based discourse types, e.g., in the entertainment market, where movies are being outsold by computer games.” This would be easy enough to prove with evidence but Aarseth gives none. Aarseth had this article published 2004 at a time when the video game industry was bringing in less money than the movie industry. 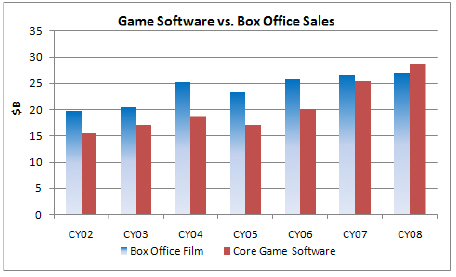 But in 2008 that all changed (see graph above) and in 2009 the game industry hit another milestone – outselling DVD and Blue-ray globally (Sliwinski 2009). Murray (2004) makes some great points regarding the need to study the narratives which are interweaved in gameplay but I am not familiar with the scholarly study of narrative (beyond these call and response essays) and would really like to hear the commentary from the class. Unlike Aarseth, Murray appears to be open to studying the rules of the game but only secondary to the narrative. Harpold (2007) sits on the fence regarding this debate. Specifically, Harpold claims that perhaps it is the intersection of narrative and gameplay which should be studied. This incorporates both view points and brings forward a third option. I am more inclined to agree with Harpold if only because it moves us away from this haughty debate and into some neutral grounds. Harpold allows for a grey area to this debate – not too conservative (ludology) and not too liberal (narratology) but just right smack in the middle. In the end games should surely be studied and respected on their own terms. Scholars should investigate games for the core, novel and interesting ways they present their rule sets and maneuver the intersection between the rules, the gameworld and gameplay. But scholarly study should not stop there. If we ignore the obvious narratives which are also created in games then we are only looking at half (or a quarter) of what games have to offer society. If my choices are ludology or narratology then I’m with Harpold and I choose both. Discussion Question: What about games (interactive narratives?) like “The Lost Experience” (extended from the Lost television series) where finding narrative easter eggs and discovering untold character development through online sleuthing is the game? The rules are not obvious and the line between reality and fantasy becomes blurred (e.g. A “Hanso” site appeared to be real all the way to the WhoIs lookup). This is not a game that is programmed. Players can continue to seek (and probably find) more information but there are no rules on where to find that information or what you might find when you get there. Aarseth, E. (2004). Genre trouble: Narrativism and the art of simulation. First Person New Media as Story Performance and Game, 45-55. Murray, J. (2004). From game-story to cyberdrama. First person: New media as story, performance, and game, 2-11. Hudson Square Research. (2010). Plugging into the video game market: Trends, challenges and opportunities in the interactive entertainment market. Last retrieved from http://www.dcia.info/activities/p2pmslv2010/1-6%20HSQR.pdf on February 15, 2012. Mast, D. (2009). Doe kaa wee-naa oe-nai boo: Assessing children’s experiences with active and passive artificial companions. Proceedings from the 13th Computer-Human Interaction Netherlands Conference. Leiden, Netherlands. Last retrieved from http://mediatechnology.leiden.edu/images/research/mast-doe-kaa-wee-naa-oe-nai-boo-assessing-childrens-experiences-with-active-and-passive-artificial-companions-chinl2009.pdf on February 15, 2012. Sliwinski, A. (2009, January 26). 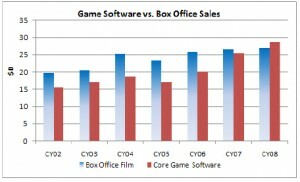 Games outsell DVD, Blue-ray at retail globally. Joystiq. Last retrieved from http://www.joystiq.com/2009/01/26/games-outsell-dvd-blu-ray-at-retail-globally/ on February 15, 2012. Not mentioned: Jenkins, H. (2006). Game Design as Narrative Architecture. In K. Salen & E. Zimmerman (Eds. ), The game design reader: A rules of play Anthology (pp. 642-670). Cambridge, MA: MIT Press.